"US for Okinawa," who initiated a major rally held on Sunday January 31st at Yoyogi Park, put together an excellent fact sheet about the base issues of Okinawa. • Although Okinawa makes up only 0.6% of Japan, it “hosts” 75% of all U.S. military bases in Japan under agreements that were made between government administrations in Tokyo and Washington DC, without consultation with the Okinawan people. • Once an independent kingdom and prosperous trading nation, Japan annexed Okinawa in the 1800s, setting the precedent for it to be used for the convenience of the rest of mainland Japan. • U.S. military bases occupy approximately 20% of Okinawa Island. • During the Battle of Okinawa in 1945 (which killed 120,000 innocent Okinawan civilians), the U.S. built many bases for the planned invasion of mainland Japan. After the war, US military forces appropriated Okinawan land using bayonets and bulldozers. The U.S. government ruled Okinawa until 1972, then reverted administration back to the Japanese government. The bases, however, remained. • The U.S. has used bases in Okinawa to launch attacks during the Vietnam War, and more recently Iraq and Afghanistan Wars. • 11 kilometers in circumference and significantly larger than Central Park in New York, this base occupies a vast swath of the center of Ginowan City. Its fleet of military helicopters have long been a vexing source of noise pollution to the people of Ginowan, whose homes, schools, libraries and hospitals have been forced to squeeze around the base. (Similar problems exist with the Kadena Air Force Base in Okinawa). Military aircraft accidents have also endangered the lives of the people of Ginowan. • Since the 1990s, the Japanese and U.S. governments have planned to start construction in Henoko by inundating Oura, a bay rich in biodiversity located in the Henoko District, with concrete in order to build a helicopter pad and aircraft runways. Local residents—many of them elderly citizens who value the role the sea has played in sustaining them and their ancestors--have thus far successfully fought this construction from commencing, and have recently marked more than 2,000 consecutive days of sit-ins to protest the plan (likely setting a world record in the process). • Oura Bay is home to the rare dugong (cousin of the Florida manatee) as well as a fragile marine ecosystem. Construction in Oura would likely spell the extinction of the dugong from Japan and the destruction of the Oura Bay ecosystem. • Although Futenma is primarily used as a training ground for Marines, the new construction in Henoko would serve as a forward base that the U.S. can use to attack other countries. • Since 1956, the U.S. military has already appropriated 90% of Henoko Village for Camp Schwab. More military construction would further deny local residents access to their traditional lands and waters. • Okinawa is the poorest prefecture in Japan. • Every year, the Japanese government pays the U.S. government approximately 2 billion US dollars as a “sympathy budget” for “hosting” the bases. Taxpayers in Japan pay 75% of the expenses of the US military bases in Japan, making Japan by far the biggest contributor of all the US “host nations” in the world. • In 2004, the total base-related income was 5.3% of the total GDP of Okinawa. However, 70% of that income is actually paid by the Japanese government's “sympathy budget”, which lowers the actual GDP value to less than 2%. • The high density of military bases on the island hampers the expansion of transportation networks, the systematic development of cities, and the acquisition of lands for industrial use. In addition to the land the U.S. military occupies in Okinawa, it also controls 29 sea zones and 15 areas of airspace around Okinawa, thereby preventing the use of this land, air and water for civilian commercial purposes. • How much income could be generated if this land, air and water were available for use and development by the local government and civilians is not clear, but in cases where bases have reverted back to Okinawa prefecture for civilian use (like the areas now known as “the American Village” in Chatan and “Shin-toshin” in Naha), the post-base development rendered much more income than when the land was being used as a base. (This also happened when the Subic Naval Base in the Philippines reverted back to civilian use). • Red sweet potato production and traditional weaving in Okinawa's Yomitan village stand out as a successful case of sustainable, community-based economic development, and serve as a positive model for other communities in creating local alternatives to a military-dependent economy. • The Japanese government is expected to pay for the relocation facility in Henoko (6 billion dollars) and more than 50% of the 11 billion dollars the U.S. will use to transfer Marines and their family members from Okinawa to Guam. Islands around the world have historically been abused by foreign military powers, which see them as globally strategic points on which to base military operations. Thus, big military powers have turned small villages, beaches, farmland, and sacred sites on islands around the world into shooting ranges, housing for military personnel, nuclear dumps, military aircraft runways, entertainment facilities for soldiers, etc. Doing so has typically destroyed economies self-sustained by farming, fishing and manufacturing into economies dependent on service industries, base-related rent, aid and compensations payments. • 24% of Oahu is owned by the U.S. military. • All of the 2,000 inhabitants of the peaceful, tropical island Diego Garcia were secretly, illegally and forcibly removed from the island in the 1960s so that it could be turned into one of the largest U.S. military bases in the world. These inhabitants were afterward condemned to lives of poverty, depression, alcoholism, prostitution, illness, and premature deaths. • Of the 9,000 residents of the island of Vieques in Puerto Rico, approximately one third are suffering from cancer and other serious illnesses after their island was long used by the U.S. military to test bombs and missiles. • For approximately 30 years, the French military used Tahiti as a base from which to conduct 45 atmospheric and 134 underground nuclear tests in the Pacific. • The US has the largest collection of bases in world history—approximately 1,000 (which does not even include the bases it maintains within the 50 states!). This number jumps increases significantly if “Foreign Operating Locations” and “Cooperative Security Locations” are included. FOLs and CSLs basically translate as national military facilities that some countries lease to the U.S. for use. • Despite great opposition from villagers, the South Korean government is CURRENTLY preparing to pour concrete over the coral reefs of Jeju Island, South Korea in order to construct a new naval base that can accommodate missile-equipped South Korean and U.S. Aegis destroyers. The United Nations has stated that the coral reefs of Jeju are key environmental treasures that should be saved, but this has not stopped construction plans from proceeding. rather than STRENGTHEN Global Security? • Bases abroad often engender grievances, and create antagonistic rather than cooperative relationships between countries. In Saudi Arabia, Yemen, Iraq and Afghanistan for example, grievances caused by U.S. military bases have helped create breeding grounds for radicalism, anti-Americanism, and attacks on the U.S., thereby reducing rather than improving its national security. • Countries such as North Korea, which feel surrounded by military bases from which sudden attacks can be launched against them, may resort to trying to obtain nuclear weapons to counteract this threat. Such action generates alarm and compels escalating tension and arms buildup in regions. • Threats to global security are not limited to extremist leaders or groups brandishing missiles. Threats to global security also include climate change and its myriad of after-effects earthquakes, tsunamis, typhoons, droughts, etc. By channeling three trillion dollars every year into military budgets, the global community risks not having adequate funding or preparation for these other threats to security. Poor handling of Hurricane Katrina stands as a good example. • Bases are being used to launch pre-emptive attacks on countries that have not declared war on others, thereby undermining international law and setting ill-advised precedent for other countries to do the same. What can provide better security? • Peace Constitutions. After abolishing its army, adopting a peace constitution in 1949, and channeling former military budgets into health and education, Costa Rica became one of the most stable countries in Latin America with one of the highest standards of living in the region. It also helped negotiate ends to conflicts between neighboring countries. • Peace Constitutions. Article 9 of the Japan’s peace constitution, which renounces war as a means of settling disputes as well as the maintenance of armed forces and other war potential, has ensured that for the past 64 years, no Japanese citizen has died in battle, nor has Japan killed citizens from any other nation. Contrast this to the pre-Article 9 period, when Japan aggression in Asia and the Pacific during WWII inflicted injury or death on millions of people, and Japan itself lost hundreds of thousands of innocent lives during the Tokyo Air Raids and the atomic bombings of Hiroshima and Nagasaki. The presence of military bases in Japan, however, limits Article’s 9 use as an effective mechanism for maintaining and expanding peace in Asia and elsewhere in the world. • Peace Constitutions. After leasing its domestic military base in the city of Manta to the U.S. for use, Ecuador found itself saddled with problems of local fishermen being denied access to their traditional port waters, increases in prostitution, and failure to realize economic growth that had been promised. In 2008, the country adopted a new constitution that declares Ecuador to be a territory of peace, promotes the peaceful resolution of conflicts, advocates for universal disarmament, and prohibits foreign military bases from occupying its territory. • Peace Constitutions. The UN Charter is essentially a peace constitution for the planet, and actually implementing the Articles it contains would do much to achieve global security. Article 26 of the Charter, for example, promotes the establishment and maintenance of international peace and security with the least diversion for armaments of the world's human and economic resources, and makes the Security Council responsible for formulating plans that can be submitted to the members of the UN for the establishment of a system for the regulation of armaments. Currently, however, the Security Council does not formulate and submit such plans. • Countries forming alliances and communities. By forming communities, agreeing to end old hostilities, and committing to not behaving aggressively toward one another, countries can stabilize their regions (as has been demonstrated in Europe). The new prime minister of Japan, Yukio Hatoyama, is aiming to do this by working with China and South Korea to form an East-Asia Community. • Creating Nuclear Weapon Free Zones. After Antarctica, Latin America and the Caribbean helped lead the world in this field by agreeing in 1967 to make the region free of nuclear weapons. • Shifting old paradigms, such as nations being in conflict and competition with one another, to nations being in co-existence and cooperation. Shifting from “preparing for peace by preparing for war” to “preparing for peace by preparing for peace,” through adopting mechanisms such as peace constitutions, engaging in dialogue and diplomacy, creating Departments of Peace, and re-channeling the world’s three trillion dollars in annual military spending into structures and initiatives that promote peace and address underlying causes of conflict. Recognizing that possessing war potential does not guarantee security—rather it engenders fear of attack and goads others to try to outdo that potential, thereby creating arms races and arms buildups that escalate tensions and hamper constructive, peaceful relations. Universal disarmament offers a way out out of this madness. Q Geoff, do you have a specific schedule of Assistant Secretary Chip Gregson's coming trip to Tokyo? And what is the goal of this trip? And do you expect any development of Futenma issue? STAFF: It’s right up above that. Security consultative talks. MR. MORRELL: Yeah, something. All right. The Security Consultative Committee. So he's going to participate in that. And then he's also going to be in Okinawa to continue discussions with Okinawan officials about realignment, Futenma replacement and so forth. MR. MORRELL: So that's the -- that's the agenda for that particular trip. Q Thank you. Satoshi Ogawa, Yomiuri Shimbun. New Nago mayor was elected last Sunday. And he announced that he would reject any new base construction in Nago, including the current FRF (Futenma Replacement Facility) plan. So does the U.S. government keep its position with the current FRF plan is the best and only operationally capable plan? And Japanese government is looking for a new location for FRF, so I’m wondering if the U.S. government is ready to renegotiate FRF plan? MR. MORRELL: Yeah, I would just say in a generic sense that we have heard the prime minister and understand his timetable to address this between now and May. We continue to work with the Japanese government in the interim on that issue, as well as a range of others. And you know, our relationship extends well beyond just Futenma replacement. I mean, it is -- it is of paramount importance to both of us that we continue to have a strong bilateral relationship particularly on the security side. We're talking. We continue to talk about a number of other things. And we continue to work the Futenma replacement issue. It's an important one. It's a fundamental part of the base realignment that we have both agreed to. We understand the timetable the prime minister is working under. We respect it. We'll work with it. And, but we still do believe fundamentally that the road map is the best plan for reducing the burden on the island of Okinawa and as it's been constructed. That said, we continue to work with our friends in Japan. If the Marines were moved entirely off of Japan, their mobility and effectiveness in the region would be impacted, and it could be perceived negatively with regard to the United States' commitment to this region. The next closest ground combat troops available are Army contingents based in Hawaii, and the distance that they would have to travel would delay U.S. responsiveness in regional contingencies. While the U.S. sees host nation support as an important contribution in terms of the overall cost of maintaining the alliance, we understand that many question how the money is being spent. That is why, in 2008, we agreed to conduct a comprehensive review of host nation support to ensure that the Japanese taxpayers benefit from the most efficient program possible. And we must continue to be vigilant stewards of Japan's investment in the American presence in this country. The relocation of Futenma Marine Corps Air Station to Camp Schwab, which involves moving 8,000 Marines to Guam, has been the most controversial part of the plan. This arrangement is certainly not perfect; no compromise ever is. But, what makes this issue especially difficult is that our two nations studied and debated virtually every conceivable alternative for more than a decade before deciding that the current plan is the best option to enable us to close Futenma as quickly as possible without degrading our ability to fulfill our treaty commitments. But I want you to know that I remain confident that we will work through the current issues and our alliance will be stronger for it. many issues local Guam residents are concerned about are the measures the military will take to acquire the additional lands they seek to complete their mission. An Environmental Impact Study (EIS) was released last November using vague language making it unclear to private landowners whether or not the military would seek to negotiate with landowners instead of resorting to the use of eminent domain and/or land condemnation. This petition calls for the military to reveal to the public their plans to acquire land and to extend the period of time residents have to review and respond to said plan. An important piece from Jan. 28 edition of Asahi Shimubun by Kyoji Yanagisawa, former head of the National Institute of Defense Studies, the research organization of the Ministry of Defense. - The core of the Futenma controversy should be how we look at the "deterrence" of the US Marines in Okinawa. - The US Marine Corps troops are ready to be deployed anywhere in the world. By the nature of their mission, they are not to stay and defend a specific region. Therefore, there should not be any correct solution in military terms to the question of "Okinawa or Guam." The choice is a political choice based on how we design this "deterrence." - Now the Cold War is over, and US, China, and Japan are economically dependent on each other. We need to reexamine the deterrence structure based on this current situation. - The meaning of having US Marines as deterrent forces is that we are ready to deploy them when it is necessary. For example, if China attacks Taiwan, a full-scale war between the US and China may begin, and the "escalation ladder" that leads to use of nuclear weapons may come into force. - Would this be a right choice for the US? Is Japan ready to say "yes" to such attacks from the bases within the country? The Government, politicians and bureaucrats alike, have not seriously examined these strategic questions. - Some experts say it is better to leave things ambiguous. However, for the regions with the burden of bases, there is no tolerance for such ambiguity. - Some say we need US Marines in Asia, but that is not a legitimate reason for having them in Okinawa. - 50 years after the revision of the Japan-US Security Treaty, Japan's strategic dependence on the US and the burden of bases remain to be the two biggest challenges of the alliance. The Futenma issue symbolic of these two issues. - There should be no hurry in reaching a conclusion, and Japan should develop new strategies on the equal basis with the US. This will be beneficial to the long-term benefit of the alliance. See also today's New York Times Editorial in which again equality is stressed in reaching a conclusion. I am sharing these articles NOT because I agree with everything they say, but because they convey the points that I find crucial, which probably both the conservatives and progressives can agree on - the importance of having objective, open and unambiguous discussions on the necessity to host US Marines in Japan with consideration to the unfair burdens that Okinawans have been forced to endure for the last 65 years. I tend to write a long email to friends that I should rather write to the public and governments. Here is what I wrote to a friend last night. I just watched another NHK news that implied that Hatoyama was questioned about his "shintai" (進退 -whether he should resign or not) for when he fails to meet the end of May "deadline." Another appalling word! Resign for what? A couple of days ago I talked about the word "koyaku" (公約 public pledge) that the media inappropriately used referring to Okada's confirmation of the May plan with Clinton on January 13 and the media's possible intention to replace that with the true koyaku in people's minds. Japanese voters knew DPJ's stance on the Japan-US relationship and its intention for Okinawa (against inter-prefectural "relocation" of Futenma) when they let them win the last Lower House election. Those were Hatoyama and DPJ's koyaku. for the conservative powers and military/business interests of US and Japan. Again, the underlying and unquestioned assumption from the left to the right is the necessity to "relocate" Futenma. The possibility of closing Futenma only is totally ignored. No matter how much sound argument Iha makes about the US plan to move most of the Marines and its operations to Guam, the mainstream media still ignore him. They do interview him and the politicians see him, but they ignore that very essence of his argument. For more information, see below article. "The alliance between the United States and Japan is a cornerstone of America’s engagement in the region and an essential pillar of the Asia-Pacific security architecture... "(Secretary of State Hillary Clinton, January 13, in the meeting with Foreign Minister Okada Katsuya of Japan). " Some data to share with you today, from the US Department of Defense website. The most updated data available was from 2001. - The total "host nation support" from all the 25 U.S. allies listed in these statistics was $7,446,430,000, approx. 7.5 billion dollars. ---Of this, Japan paid $4,614, 850,000, approx. 4.6 billion dollars. --- It is approx. 62% of the total host nation support by all the 25 countries. --- It is about 3 times as much as the total of the NATO allies ($1,561,720,000) paid. --- It is about 6 times of what Korea paid ($804,980,000). --- It is about 5 times of what Germany paid ($861,660,000). - The "U.S. Stationing Cost Offset Percentage" for Japan, which is the percentage of what Japan paid against the total cost of US military stationing expenses, is 75.3%. --- The average of the "U.S. Stationing Cost Offset Percentage" is about 50%. Some countries to compare with - Korea (38.9%), Belgium (40.1%), Saudi Arabia (54.3%), Germany (21.1%), Italy (34.0%), the United Kingdom (15.4%). I wouldn't want to lose that "cornerstone" if it were underneath my house! If I were a taxpayer of Japan, I would never accept such a situation. If I were the Japanese Government, I would make sure the taxpayers in Japan get as little information as possible about these facts. Including the residences way more luxurious than ordinary Japanese civic servants', golf courses, entertainment facilities, shopping centres and the hefty utility bills. I am not blaming those soldiers; I am blaming the Japanese taxpayers and voters who are allowing this to happen, including myself. Here is a YouTube video of Gabe Masaaki, Professor at Ryukyu University talking about the Futenma "relocation" issue - from the NHK program "Shiten/Ronten" on November 26, 2009. For English-language readers, the below articles well summarizes the arguments that Gabe makes in this video. "Okinawa Marines’ Raison d’etre lost in a changing world"
In times of the Cold war, the United States tried to keep military bases close to the USSR and China, in its effort for military dominance over them. It was a strategy for forward deployment and also for an engagement to defense of the alliance of the western countries. One of the posts is Okinawa. The U. S. bases on Okinawa are said to have played a role to contain China, North Korea, and the USSR, and protect the U.S. allied Japan, South Korea, Taiwan, and Philippines. The U.S. military strategy during the Cold War had two striking points. The enemies are military powers of hostile countries. They were a regular army with uniform of the USSR or China. And, readiness of U.S. forces was said to be vital in order to respond to enemy’s action. It was necessary for a swift reaction to deploy forces from the forward bases such as Okinawa. After the collapse of the walls of Berlin, and the 9.11 terrorism, the enemies of the U.S. forces are no more regular uniforms. There are no military powers that challenge to the U.S. forces which have matchless destructive power. Enemies of them are individuals or groups of terrorism with weapons who try to challenge the U.S.. Chechens to Russia, Tibetans to China, Palestinians to Israel, even if they are defined as terrorists, are not enemies that the U.S. will attack. A war on terrorism starts when the U.S. forces are ready, and America determined to do. During past 20 years, basic strategy of the U.S. military had changed. But, still, some experts insist the U. S needs to maintain readiness to contingencies in Korean peninsula or Formosa Strait, where influence of the Cold War remains. Nevertheless, as time changes, ways of waging a war also change. In East-Asia, a possibility that the U.S. engages in a war with its ground forces is very much low. For that reason, sea and air powers have been given much priority. Today, air to air fight even becomes hard to expect, and a sea power solely in the open sea is becoming to be enough power for the regional stability. In these changes, the U.S. Marine Expeditionary Unit, with 3,000 Marines, structured as Marine Air-Ground Task Force would fight against enemies, become to have less and less chances for deployment. It is the United States of America to determine who is enemy and when to pull the trigger of a war. The plan to relocate the 8,000 U.S. Marines, from Okinawa to Guam shows that a legitimate reason of that the large scale ground troops are deploying in Okinawa is disappearing. I started this post by listing the English-language reports of the Nago election result, and I am still adding - not just immediate reports but subsequent analyses. I will update reports in English here. If the pro-base candidate had won, the pro-base media would argue that the Nago residents approved the Henoko base construction. Now that the anti-base candidate has won, those media say the local election can't decide or shouldn't influence the national security decision. Let's go back to the basic. Why would only Japan need III MEF where NO OTHER COUNTRY needs it? Japan does not need IIIMEF to stay, and the US knows that. Check the details of the Guam Integrated Military Development plan. Plans are already underway to move most of the Marines from Okinawa to Guam. Military colonization of Guam is another problem we must address, but one thing that is absolutely clear is that there is no substitute facility needed in Japan when Futenma is returned to the people of Okinawa. See YouTube video of an interview with those protesting. Okinawa is part of a group of Japanese islands situated between Taiwan and Japan. During the Second World War Okinawa was invaded by allied troops destroying nearly 90% of all buildings and killing between 42,000 and 150,000+ civilians. After the war Okinawa was under US administration for 27 years until 1972. During this time the US established many bases on the island. To this day many US facilities still occupy a large part of the island and is home to approximately 23,000 US troops. The troops remain in Japan under a treaty signed in 1952 that was later amended in 1960. This treaty allows the United States to retain their bases, “For the purpose of contributing to the security of Japan and the maintenance of international peace and security in the Far East”. 75% of the United States military bases within Japan are located in Okinawa. Residents of Okinawa are spilt in their opinion about the US bases. Some see the economic advantage of hosting US troops. Many residents are employed to work on the bases and others whose business benefits from their trade. However, many residents also oppose the presence of the US military sighting crimes committed on the island by the troops, destruction of the environment, noise and pollution. There are many campaigns against military bases in Japan. Usually they work independently of each other. However they do join forces for large-scale protests when a major incident occurs. For example, in 1995 when three US servicemen raped a 12-year-old girl. In Okinawa there is a small campaign based in Takae. Takae is a small village1 surrounded by jungle at the northern end of the island within the district1 of Higashi and has a population of about 150 people. The campaign is against the construction of new helipads that would be used by the US military. Many of the bases in Okinawa are aging and some will be decommissioned. But with the decommissioning, the US also wants to build new helipads in previously untouched jungle. The Japanese government, eager for the construction contracts, are willing to let construction go ahead. In February 2006 the Takae helipad campaign began. The campaign was formed by a small number of residents none of whom had any previous campaigning experience. Between them they set up 24- hour guard at entrances to the helipad construction sites. They confronted the construction workers and blocked access to the new helipad sites. Once built, the helipads role would be used in the training of mainly US troops in Jungle warfare. The campaigners concerns about the new helipads are related to the environmental destruction of the jungle, noise and air pollution. As well their concerns for the environment, they are also against the use of their homeland for the training of military personnel, that they will be taught about killing and jungle warfare literally on their doorsteps. There are also safety concerns after one helicopter crashed near Takae close to their elementary school in 1999. And in 2004 a US military helicopter crashed in the grounds of a university in the city of Ginowan. The US military are planning to replace their helicopters (CH53D, CH46E…) in Okinawa with the new Osprey. The Osprey is a vertical take off and landing aircraft that can fly twice as fast, carry 3 times the current load and travel 5 times further than the helicopters in use at the moment. The Japanese government are currently trying to apply for a Provisional Disposition against 14 of the main helipad campaigners. Originally the number was 15 and included a child, but after a public outcry the child was removed from the order. A provisional disposition can be viewed in the UK as something between an ASBO and injunction. The affect of the court case may scare people from continuing the campaign and also to disable the campaign by punishing the main members of the organisation. While the court case proceeds the Okinawa Defence Bureau has promised not to carry out further helipad construction. However, if the court case becomes lengthy, it is possible construction may begin again before a decision is reached in court. Interview with Ginowan Mayor Iha Yoichi, from the February 2010 edition of Sekai. This is a petition campaign initiated by the Japanese chapter of the ICBUW, International Coalition to Ban Uranium Weapons. For the past posts about DU, click here. This petition is addressed to Prime Minister Hatoyama and Foreign Minister Okada, and is only available in Japanese for now. This is a report by Yumiko Kikuno, Editor of a community journal "U-yu-yu" based in Miyazaki. Yumiko and I visited the "Henoko Tent Village" together on December 25, 2009. This is my contribution to the book "Kato Shuichi for Me" (Kamogawa Publishing, 2009), which I wrote about in my January 1 post. We, the undersigned global organizations and individuals, call upon the South Korean and US governments to cancel all plans to build a Navy base on Jeju Island. The base will destroy coral reefs that have been listed as world heritage environmental sites by the UNESCO and will destroy the fishing and way of life of the people. The deployment of naval Aegis destroyers, outfitted with missile defense systems, will be used to surround and provoke China and will make Jeju Island a prime target. Jeju is called the peace island and must remain free of provocative military bases. I try not to visit a place and then forget about the people and the struggle they are engaged in. Since my visit to Jeju Island, and the Gangjeong village last October, I have been closely following developments about the South Korean government's plan to build a Navy base where pristine coral reefs, fishing, and tangerine groves are now integral to the people's way of life. The base construction is soon set to begin in Gangjeong. The villagers are currently setting up a tent camp along the rocky shore line where the Navy intends to pour concrete to cover the rocks and tiny marine life to make their wharfs where the Aegis destroyers will be homeported. The ships, from the South Korean and US fleets, are outfitted with "missile defense" systems and will surely be used to continue surrounding China's coastal region. Jeju Island, now called the peace island, will thus become a prime military target. As I now hear about their protest heating up, as they prepare to face the bulldozers of destruction, my heart goes out to them. I wish I could join them in sitting in protest against this base. This Navy base will have a direct negative impact on ourwork to restrain US military expansion in the region and will ultimately provoke more conflict with China. Here is an update from Sung-Hee Choi. police harshly acted today, against the people who are mostly in their old ages. The village people laid their bodies on the ground and cried to rather kill all of them. They pushed the old women and men. The police did not even mind women's underwears were taken off during the body struggles. The whole story reminds the Pyeongteak when the police attacked the village early in the dawn of May 4, 2006. Around 6~8pm: About 47 village people including a mayor were taken away to the police station. The police unconditionally took away all the people if they protested. 8~10:30am: five activists including Secretary Go Yu Gi, and two Catholic fathers were taken away to the police, after the short press interview. The activists strongly protested against the police and were dragged from the cranes they were protesting on the top of them. All the captured were separately detained in the three police stations of the Jeju Island. Some may be released soon or some may be even restrained. We don't know yet but the mayor is expected to get the arrest warrant. A 70 year old man is in comma. He hit his head on the stone when he was pushed by a police man. He was protesting against the police who was pushing an old woman. A Korean Confederation of Trade Union activist, 41 years was carried to the hospital but released hours later. Currently (at 8pm), about 30~40 people including 20 village people (mostly in their ages of 40~60) and 20 Jeju activists (30~40 years old) are doing the candle light vigil overnight in the confined area. The police blocked the people entering the place. The police are expected to be mobilized again tomorrow morning. A Jeju activist there says, once they are all taken away by the police tomorrow, they may not be able to enter the area again. Because of small numbers there, brutal taking away is expected. But she said the protests in front of the area will go on, afterward. It is possible to contact with the people there by phone and all the international message are carried briefly via it. It empowers the people there. In the area for the planned ceremony, all the barricades of cars by the village people were removed. Wire fence was set up. And the contacted cranes have begun the basic construction process. There are about six cranes in the area for tomorrow's continued construction. * Consider to come to the village and join the struggle. Even if it is a few days, it will be the greatest support to the village people. The Jeju organizations can provide the accommodation place but not airplane fee. The experience of the Vieques will be much help here in Jeju that is an isolated place from the mainland of Korea. More details will be followed later. A Japan Focus Article: "Why Build a New Base on Okinawa When the Marines are Relocating to Guam? : Okinawa Mayor Challenges Japan and the US"
The Shore of Henoko and the "Tent Village," where activists are sitting-in to stop the construction of a new base. Your interest in this issue will be greatly appreciated. Regarding the "Futenma Air Station 'relocation'" issue, much of the government and media debate has been based on the assumption that a new base has to be constructed. Mayor of Ginowan City, where Futenma Air Station is located, challenges that assumption and argues that plans are underway for most of the Okinawa Marines to be relocated to Guam, making the construction of a new base in Henoko or anywhere unnecessary. Please distribute this article widely. Especially wide dissemination in the U.S. and to its media are important. "Why Build a New Base on Okinawa When the Marines are Relocating to Guam? : Okinawa Mayor Challenges Japan and the US"
English-language information on this issue is limited. At the end of the above article you will see links to some other related articles. The original Japanese version is here. Upcoming Film Screening "The Sirota Family and the 20th Century"
The English version of this announcement follows the Japanese version. "The Sirota family and the 20th Century"
• First screened in October, 2008 at Iwanami Hall in Tokyo ; received many great reviews in Japan and France. • The film won the Jury Award at the Seventh Kiev International Film Festival in 2008. Please join us at this Canadian premier public showing of the film, made under a special arrangement with its director. Tea will be served; snack donations are welcome. This event is sponsored by Vancouver Save Article 9 and Peace Philosophy Centre. This is a moving story of the 20th century about an artistic Jewish family, the Sirota family, originally from Ukraine. Beate Sirota, daughter of an internationally renowned pianist Leo Sirota, and Aline, Leo’s brother’s granddaughter, together trace the lives of Leo and his brothers, who lived in many parts of the world including Ukraine, Vienna, Tokyo, Warsaw, Paris, and the United States. Leo Sirota lived in Japan for almost two decades starting in 1929, and fostered many great Japanese musicians. The Sirota family's tragic life seems like a miniature history of the 20th century. "The remarkable documentary film maker Ms. Tomoko Fujiwara has again demonstrated her courage and her dedication to peace by producing this film. The film describes the fate of a Jewish family in WWII in Europe - their flight from one country to another, their loves and their sorrows, their deaths in battle and concentration camps. 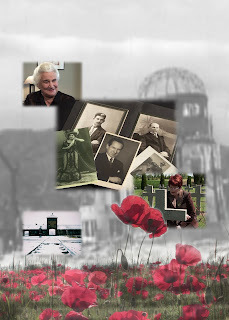 As the daughter of one of the family members, the pianist Leo Sirota, who lived in Japan for 17 years, my hope is that the people who see the film will learn about history and horrors of war, and will strive for everlasting peace in the future." Beate Sirota, an outspoken defender of Article 9, the war-renouncing clause of the Japanese Constitution says, "It is a model constitution. The real creator of the Constitution is the wisdom of history." Towards the end of this film, we are taken to the Peace Square in Telde, Spain, where Article 9 is inscribed on a plaque. The mayor says, “Article 9 is the hope of the world." Introducing the Japanese Version of Daniel Ellsberg's Memoir "Hiroshima Day: America Has Been Asleep at the Wheel for 64 Years"
This column was originally published on Truthdig.